Viola Eggers was born circa 1909 at Wisconsin. She was the daughter of William Eggers and Mary Schneider. [S243] U.S. Federal Census 1920 U.S. Federal Census, by Ancestry.com, ED124. Dwelling 144. Married Name November 1930 As of November 1930,her married name was Lawrence. Marcella Eggers was born circa 1913 at Wisconsin. Marcella Eggers married William Lawrence in November 1930 at Dubuque, Dubuque, Iowa, Marcella Eggers and William Lawrence marriage announcement. Luella Eggers was born circa 1918 at Wisconsin. Married Name before 1925 As of before 1925,her married name was Hartstrom. Lena R. Wackershauser was born circa 1883 at Wisconsin. She was the daughter of Henry Wackershauser and Louisa Maring. Name Variation Frederick W. Lebben was also known as Fred J.
Frederick W. Lebben was born on 31 December 1894 at Wisconsin. He was the son of John L. Lebben and Anna B. Wackershauser. Henry John Lebben was born on 6 November 1889 at Wisconsin. Married Name Her married name was Harvey. Rose Schmelz married Morten Harvey Sr.
Rose Schmelz was born circa 1880. She was the daughter of Joseph Schmelz and Barbary Maring. Children of Rose Schmelz and Morten Harvey Sr.
Morten Harvey Sr. married Rose Schmelz, daughter of Joseph Schmelz and Barbary Maring. Morten Harvey Sr. died before 1925. Chester Harvey was born circa 1904. He was the son of Morten Harvey Sr. and Rose Schmelz. Morten Harvey Jr. was born circa 1906. Married Name 7 June 1938 As of 7 June 1938,her married name was Kowalski. Irene M. Kieler was born on 8 April 1919 at Paris, Grant, Wisconsin. She was the daughter of Arthur John Kieler and Elizabeth Dora Loeffelholz. Irene M. Kieler married Donald Francis Kowalski, son of George Kowalski and Theresa Bode, on 7 June 1938 at Kieler, Grant, Wisconsin, Irene Kieler and Donald Kowalski marriage announcement. Irene M. Kieler died on 3 October 2006 at age 87 Irene M. Kowalski, age 87, of Cassville, died on Tuesday, Oct. 3, 2006, at the Grant Regional Health Center in Lancaster. She was born on April 8, 1919, in Paris Township, daughter of Arthur and Elizabeth (Loeffelholz) Kieler. On June 7, 1938, she married Donald F. "Doc" Kowalski at Immaculate Conception Catholic Church in Kieler. 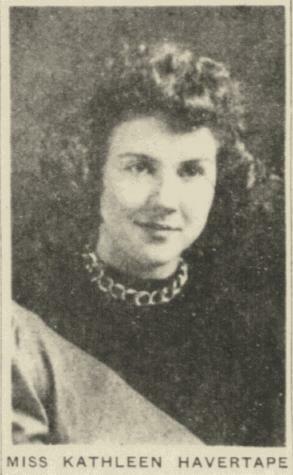 Irene was the original bookkeeper for Kowalski-Kieler, Inc., which her husband co-founded with her brother, Lester Kieler, in 1946. Irene was a member of St. Charles Catholic Church and the National Council of Catholic Women. She loved spending time with her family and she enjoyed reading, cooking, sewing and traveling. Irene is survived by seven children, Mary Jane (Roger) Droessler, Dickeyville, Julaine (Wilfred) Udelhofen, Cassville, Betty Lou (Wayne) Kruser, Dickeyville, James (Charlotte) Kowalski, Dickeyville, Donna Jean (Larry) Bernhardt, Cassville, Collette (the Rev. Tom Hallowell) Kowalski,Schuyler, Neb., and Colleen Kowalski, Cassville; 23 grandchildren; 33 great-grandchildren; two sisters, Orpha Schneider, Cuba City, and Sr. Genesia Ginter, OSF, Milwaukee; a brother, Arthur (Kathleen) Kieler, Hazel Green; and many nieces and nephews. In addition to her parents and her husband, Doc, Irene was preceded in death by her brothers, Lester (Shirley) Kieler and Gene Ginter; and a brother-in-law, Francis Schneider. Funeral services will be held on Saturday, Oct. 7, 2006, at 10 a.m. at ST. CHARLES CATHOLIC CHURCH in Cassville with Father John Norder officiating. Burial will be in the church cemetery. Visitation will be held from 4 p.m. until 8 p.m. on Friday, Oct. 6, 2006 at the church. Memorials may be offered to St. Charles Catholic School. She was buried after 3 October 2006 at Saint Charles Catholic Church Cemetery, Cassville, Grant, Wisconsin. [S250] U.S. Federal Census 1930 U.S. Federal Census, by Ancestry.com, Year: 1930; Census Place: Jamestown, Grant, Wisconsin; Roll: 2574; Page: 2B; Enumeration District: 22; Image: 336.0. Dwelling 19. Arthur John Kieler was born in February 1894 at Wisconsin. He was the son of Frank Kieler and Margaret Koethe. Arthur John Kieler married Elizabeth Dora Loeffelholz, daughter of George Loeffelholz and Matilda Kirchberg, in 1916. Arthur John Kieler witnessed the death of Margaret Koethe on 17 January 1929 at Kieler, Grant, Wisconsin; Mrs. Margareth Kieler, widow of Frank Kieler, died at the residence of her son, Arthur Kieler, in Kieler, Wisconsin, Thursday evening, January 17, 1929, at 7:30 o'clock, following a short illness. She died comforted with the last rites of the Catholic religion. The funeral was held on Monday morning, January 21, at 10 o'clock, from the residence of her son, Arthur Kieler, to the Immaculate Conception Church in Kieler, where the mass of requiem was read by Rev. Father Greiveldinger, pastor. The remains were placed in the cemetery adjoining the church. 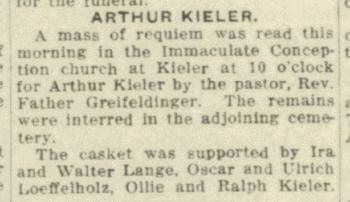 Ollie and Ralph Kieler, and Frank, Walter, Ervin, and Ira Lange, grandsons of the deceased, were the pallbearers. Mrs. Kieler was survived by two daughters, Mrs. Charles Lange, of Kieler, Wis., and Mrs. Frank Kuhl of Hazel Green, Wis., and three sons, Edward Kieler, of Hazel Green, Wis., and Charles Kieler and Arthur Kieler, both of Kieler, Wis.
Arthur John Kieler died on 18 February 1929 at at home, near Kieler, Grant, Wisconsin, Arthur Kieler obituary. He was buried after 18 February 1929 at Immaculate Conception Church Cemetery, Kieler, Grant, Wisconsin. On 2 July 1921 at Kieler, Grant, Wisconsin, George and Dorothea (Montag) Kieler 50th wedding anniversary celebration. [S245] U.S. Federal Census 1900 U.S. Federal Census, by Ancestry.com, Year: 1900; Census Place: Paris, Grant, Wisconsin; Roll: T623_1790; Page: 8B; Enumeration District: 47. [S244] U.S. Federal Census 1910 U.S. Federal Census, by Ancestry.com, Year: 1910; Census Place: Paris, Grant, Wisconsin; Roll: T624_1711; Page: 7B; Enumeration District: 0039; Image: 361; FHL Number: 1375724. Name Variation Elizabeth Dora Loeffelholz was also known as Dora Elizabeth. Name Variation Elizabeth Dora Loeffelholz was also known as Lizzie. Married Name 1916 As of 1916,her married name was Kieler. Married Name after April 1930 As of after April 1930,her married name was Ginter. Elizabeth Dora Loeffelholz was born in February 1897 at Wisconsin. She was the daughter of George Loeffelholz and Matilda Kirchberg. Elizabeth Dora Loeffelholz married Arthur John Kieler, son of Frank Kieler and Margaret Koethe, in 1916. Elizabeth Dora Loeffelholz married Louis F. Ginter after April 1930 at second marriage for her. Elizabeth Dora Loeffelholz died on 14 April 1981 at age 84 Elizabeth D. "Lizzie" Kieler Ginter, 84, of Dickeyville, Wisconsin, died Tuesday, April 14, 1981, at Southwest Nursing Home in Cuba City, Wisconsin. Family and friends called from 4 to 9 p.m., Friday, April 17, at the Haudenshield Funeral Home in Cuba City, where the Rosary was said at 8 p.m. Funeral services were held at 10:30 a.m., Saturday, April 18, at Holy Ghost Catholic Church in Dickeyville. Burial was in Immaculate Conception Cemetery at Kieler, Wisconsin. Elizabeth Kieler Ginter was survived by three daughters, Mrs. Donald (Irene) Kowalski, of Cassville, Wis., Mrs. Francis (Orpha) Schneider, of Rt. 1, Cuba City, and Sister Mary Genesia Ginter, OSF, of Milwaukee, Wis; three sons, Lester L. Kieler and Gene O. Ginter, both of Dickeyville, Wis., and Arthur C. Kieler, of Rt. 1, Cuba City; 34 grandchildren and 45 great-grandchildren; six brothers, George Loeffelholz, of Hawaii, Viric Loeffelholz, of Sparta, Wis., David Loeffelholz, of Dubuque, Ia., Harold Loeffelholz, of Clinton, Ia., Vincent Loeffelholz, of East Dubuque, Ill., and Dan Loeffelholz, of Potosi, Wis; and three sisters, Mrs. Ernie (Bea) Studier, of Dubuque, Ia., Mrs. Frieda Kruser, of Cuba City, Wis., and Mrs. Vincent (Nellie) Dalsing, of Hazel Green, Wis.
She was buried after 14 April 1981 at Immaculate Conception Church Cemetery, Kieler, Grant, Wisconsin. Name Variation Donald Francis Kowalski was also known as Doc. Donald Francis Kowalski was born on 21 June 1918 at Dickeyville, Grant, Wisconsin. He was the son of George Kowalski and Theresa Bode. Donald Francis Kowalski married Irene M. Kieler, daughter of Arthur John Kieler and Elizabeth Dora Loeffelholz, on 7 June 1938 at Kieler, Grant, Wisconsin, Irene Kieler and Donald Kowalski marriage announcement. Donald Francis Kowalski died on 20 June 2003 at age 84. He was buried after 20 June 2003 at Saint Charles Catholic Church Cemetery, Cassville, Grant, Wisconsin. Lester L. Kieler was born on 12 February 1922 at Wisconsin. He was the son of Arthur John Kieler and Elizabeth Dora Loeffelholz. Lester L. Kieler married Shirley Mae McCauley, daughter of Leonard McCauley and Dorothy Collins, on 25 October 1949. Lester L. Kieler died on 8 September 2005 at age 83 Lester Kieler, age 83, of Dickeyville, died on Thursday, Sept. 8, 2005, at Southwest Health Center Nursing Home in Cuba City. Lester grew up in the depression, growing up early and learning self-reliance. He used that attribute in World War II, hand crafting jewelry from silver in the South Pacific and sending every extra pound he made, back to his mother in Kieler. Lester knew what he wanted, to provide and he did unselfishly for his mother, himself and eventually his own family. His ambition, along with the money he saved, led him to create his own business, Kowalski-Kieler Inc., with his brother-in-law, Donald Kowalski, in 1946. After marrying his sweetheart, Shirley, they began their family and his adventurous nature took over. They would take their children on several memory filled trips. Of all the places they traveled, none was more loved than Lester's favorite place in the world, Danbury. His instigating ways, ability to tell some stories and pull pranks always kept everyone thinking and laughing. His creativity and wit was not only in his humor, it was also evident in his ability to rebuild a car from scratch (welding like a true craftsman), making sausage and canning tomatoes from his well loved garden. He knew he wanted to serve in World War II and he certainly did. He would share the good stories from that era. The favorite was chauffeuring John Wayne and General MacArthur. He continued his want to serve as an active member of the VFW and an assistant fire chief for the fire department, as well as helping his sons in the Boy Scouts. Lester always seemed to quietly know what he wanted. He was a modest man and never boasted. His love for his family was always there with a warm smile and a "ho ho there, come sit on grandpa's lap"; he just loved his grandchildren. He was always cheerful, never complained, he was always "100 percent." He loved his family, he loved his life, and since Jan. 23, 2005, he knew what he wanted again, and that was Shirley. He attained that on Sept. 8, 2005; a true love everlasting being with her face to face, and calling her "Snooks" once again. Lester is survived by two daughters, Lois (Dave) Fritz of Potosi, and Jenny (Greg) Loyda of Whitefish Bay; four sons, Jack (Lois) Kieler, Timothy (Shari) Kieler, Dennis (Cheryl) Kieler, all of Dickeyville, and Dean (Carie) Kieler of Lake Mills; grandchildren, Dr. Nathanial (Margaret) Kieler, Tyler Kieler, Shane Kieler, Chase Kieler, Paige Kieler, Emily Fritz, Maddie Fritz, Rachael Fritz, Timmy Fritz, Michael Loyda, Casey Loyda, Samantha Loyda, Kevin Kieler, Audreyann Kieler, Meghan Taylor, Travis (Kelly) Kieler, Shawn (Larry) Rogutich, and Josh Kieler, U.S. Navy; four great-grandchildren, Dylan, Payton, Ivan and Nadia; a great-grandson, soon to be born; three sisters, Mrs. Irene (Donald) Kowalski of Cassville, Mrs. Orpha (Francis) Kieler of Hazel Green, and Sister Genesia Ginter of Milwaukee; and a brother, Artie (Katie) Kieler of Hazel Green. He was preceded in death by his wife, Shirley, in 2005; a son, Lester "Les" Kieler, in 1998; his parents; a daughter-in-law, Joan Kieler; and a brother, Gene Ginter. Funeral services will be on Monday, Sept. 12, 2005, at 10:30 a.m. at HOLY GHOST CATHOLIC CHURCH in Dickeyville, with Father Francis Steffan officiating. Burial with military rites will be in the church cemetery. Friends may call on Sunday, Sept. 11, 2005, from 3 p.m. until 7 p.m. at the HAUDENSHIELD FUNERAL HOME, Cuba City and from 9:30 a.m. on Monday until the time of service at the church. A parish wake service will be at 3 p.m. In lieu of flowers, a Lester Kieler Memorial Fund has been established. He was buried after 8 September 2005 at Holy Ghost Cemetery, Dickeyville, Grant, Wisconsin. Name Variation Orpha M. Kieler was also known as Orphia. Married Name 8 June 1948 As of 8 June 1948,her married name was Schnider. Married Name 8 June 1948 As of 8 June 1948,her married name was Schneider. Orpha M. Kieler was born on 15 December 1924 at Wisconsin. Orpha M. Kieler married Francis J. Schneider on 8 June 1948 at Kieler, Grant, Wisconsin, F J Schneider and Orpha Kieler marriage announcement. Orpha M. Kieler died on 14 January 2009 at age 84 Orpha was born on December 15, 1924, in Paris Township, Wisconsin, the daughter of Arthur and Elizabeth (Loeffelholz) Kieler. She married Francis Schneider on June 8, 1948, at Immaculate Conception Church in Kieler. He preceded her in death on January 14, 2003. 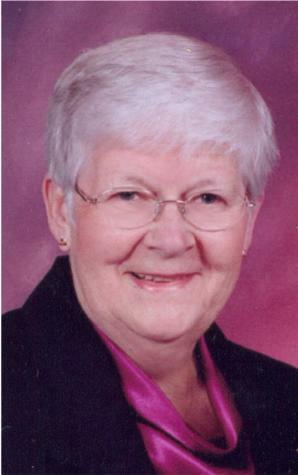 Orpha was an active member of Council of Catholic Women at Sinsinawa and Cuba City. She and Francis farmed near Louisburg until 1991 when they moved to Cuba City. Orpha was a great cook and was known for her famous “Schneider Spread” dinners. She will be remembered for her pies and particularly those chocolate chip peanut butter cookies. Orpha was a devoted wife and mother who never complained and was always willing to help. She enjoyed her canasta card club. Orpha won many ribbons at the Steele County Fair in Minnesota for her crocheting and quilting. She is survived by two daughters, Jane (John) Brant of Cuba City, WI, and Joann (Peter) Moothart, of Owatonna, MN; one sister, Sister Genesia Ginter OSF, of Milwaukee, WI; a brother, Arthur (Katherine) Kieler, of Hazel Green, WI; a sister-in-law, Elaine Ginter, of Edgerton, WI; five grandchildren, Jamie, Scott and Cory Brant, and Emily and Kayla Moothart; six great-grandchildren, Andrew, Jacob, Ally Orpha, Darcy, Hannah, and Hailey Brant. She was also preceded in death by her parents; a sister, Irene Kowalski; two brothers, Lester Kieler and Gene Ginter; a brother in-law, Donald Kowalski; and a sister-in-law, Shirley Kieler. Name Variation Francis J. Schneider was also known as F. J. Name Variation Francis J. Schneider was also known as Schnider. Francis J. Schneider married Orpha M. Kieler, daughter of Arthur John Kieler and Elizabeth Dora Loeffelholz, on 8 June 1948 at Kieler, Grant, Wisconsin, F J Schneider and Orpha Kieler marriage announcement. Francis J. Schneider died on 14 January 2003. Married Name Her married name was Kieler. Name Variation Sister Genesia Ginter OSF was also known as Jeanette Ginter. Sister Genesia Ginter OSF was born on 13 August 1936 at Kieler, Grant, Wisconsin. She was the daughter of Louis F. Ginter and Elizabeth Dora Loeffelholz. Sister Genesia Ginter OSF died on 4 October 2017 at age 81. She was buried after 4 October 2017 at Mount Olivet Cemetery, Milwaukee, Milwaukee, Wisconsin. Name Variation Arthur C. Kieler was also known as Artie. Arthur C. Kieler was born on 20 February 1927 at Paris, Grant, Wisconsin. Arthur C. Kieler married Kathleen A. Havertape, daughter of Aloysius Havertape and Olefa Neis, on 4 September 1947 Arthur Kieler and Kathleen Havertape engagement announcement. Arthur C. Kieler died on 9 March 2010 at Lancaster, Wisconsin, at age 83 Arthur C. “Artie” Kieler, 83, of Kieler, Wisconsin, died Tuesday, March 9, 2010, at Grant Regional Health Center in Lancaster. Services will be 10:30 a.m. Saturday, March 13, 2010, at Immaculate Conception Church in Kieler with Rev. Bernard Rott officiating. Burial will be at a later date. Friends may call from 3-8 p.m. Friday at Immaculate Conception Parish Center in Kieler where the parish wake service will be at 2:45 p.m. Friends may also call from 9:00-10:15 a.m. at the parish center before the service on Saturday. Casey Funeral Home & Cremation Services of Cuba City is in charge of arrangements. 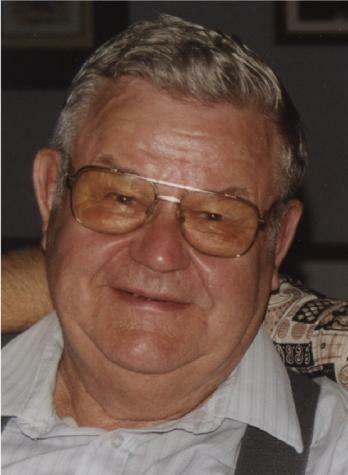 Arthur was born on February 20, 1927, the son of Arthur C. and Elizabeth (Loeffelholz) Kieler, on his father’s dairy farm in Paris Township two miles northwest of Kieler. He married Kathleen “Katie” Havertape on September 4, 1947 at St. Joseph's Church in Sinsinawa, WI. They farmed all their lives until their retirement from farming in 1986. They moved to 1535 Fredrick Street, rural Hazel Green, Wisconsin, in the Pascal Skemp Subdivision near Bluff Road. Arthur was an outstanding crop farmer who raised corn, alfalfa, oats and wheat. He was a progressive dairy farmer who made continuous improvements to enhance the production of milk from his dairy herd. Arthur was a “steward” of the land. He worked with the Conservation Commission to improve water erosion by building dams, grassy waterways and detention ponds. Arthur was also named the outstanding “Soil Conservationist” in 1976 for Grant County, Wisconsin. He was a frontrunner in establishing contour (strip) farming in Grant County. When Arthur moved to rural Hazel Green, he became a master gardener, planted fruit and pine trees, made wine, and built numerous purple martin houses. He enjoyed working outdoors, especially in his garden and orchard. Arthur referred to his place along the river as “heaven.” Arthur enjoyed fishing from the “barge”, and his view of the Mississippi River and Lock & Dam. Additionally, Arthur enjoyed the large variety of ducks, geese, bald eagles and all the other wildlife that inhabited the Mississippi River. Other favorite activities were trips to Door County, ice fishing, snagging salmon, and fishing from chartered boats for lake trout. He enjoyed deer hunting and made many deer hunting trips to Black River Falls, Wisconsin. Arthur was the best dad in the world and was loved dearly by his family. Survivors include his wife of 62 years, Katie; six sons and four daughters, Tom (Ruth), of Platteville, Ken (Martha) of Hazel Green, Connie Dolan, of Hinsdale, IL, Sandy (Denny) Todhunter, of Chico, CA, Nicholas (Theresa), of Burlington, IA, Darrell, of Memphis, TN, Michele (Richard) Thomas, of Asbury, IA, Lisa (Jim) Rindy, of Elk River, MN, Glen (Gloria) of Temecula, CA, and Chris, of Hazel Green; a sister, Sister Genesia, of Milwaukee; 29 grandchildren; and 36 great-grandchildren. He was preceded in death by his father, Arthur Sr., in 1929; his mother, Elizabeth, in 1980; an infant daughter, Mary Ellen; an infant great-granddaughter, Garrett Ubersox; two brothers, Lester Kieler and Gene Ginter; and two sisters, Irene (Donald) Kowalski and Orpha (Francis) Schneider. He was buried after 9 March 2010 at Immaculate Conception Catholic Church Cemetery, Kieler, Grant, Wisconsin. Name Variation Kathleen A. Havertape was also known as Katie. Married Name 4 September 1947 As of 4 September 1947,her married name was Kieler. Kathleen A. Havertape was born on 21 December 1929. She was the daughter of Aloysius Havertape and Olefa Neis. Kathleen A. Havertape married Arthur C. Kieler, son of Arthur John Kieler and Elizabeth Dora Loeffelholz, on 4 September 1947 Arthur Kieler and Kathleen Havertape engagement announcement. Kathleen A. Havertape died on 24 September 2011 at age 81 Kathleen A. 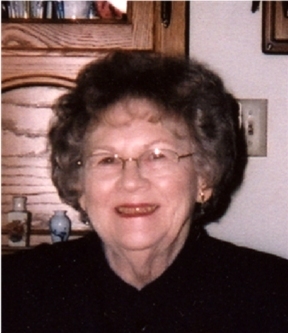 “Katie” Kieler, 81, of Hazel Green, WI, died Saturday, September 24, 2011, at home. Services will be at 10:30 a.m. Wednesday, September 28, 2011, at Immaculate Conception Church in Kieler with Reverend Bernard Rott officiating. Burial will be in the church cemetery. Friends may call from 4-8 p.m. Tuesday at the Immaculate Conception Parish Center in Kieler where the parish wake service will be at 3:45 p.m. Friends may also call from 9-10 a.m. Wednesday at the parish center before the service. Casey Funeral Home & Cremation Services of Cuba City is in charge of arrangements. Katie was born on December 21, 1929, in Dickeyville, WI, the daughter of Aloysius and Olefa (Neis) Havertape. She graduated from St. Clara’s Academy in Sinsinawa. Katie married Arthur C. Kieler on September 4, 1947, at St. Joseph’s Church in Sinsinawa. He preceded her in death on March 9, 2010. She and Arthur worked side by side on the family farm in Paris Township north of Kieler for 40 years and then moved to Skemp's Subdivision, where they lived for 24 years. Katie was patient, loving and kind. Her family often referred to her as their earth angel. She raised 10 children. Katie gave life to canvas by painting beautiful country scenes. She also enjoyed antiquing, wood refinishing, gardening, and bird watching. Surviving are her six sons and four daughters, Tom (Ruth), of Platteville, Ken, of Dubuque, Constance Dolan, of Hinsdale, IL, Sandy (Denny) Todhunter, of Chico, CA, Nicholas (Terry), of West Burlington, IA, Darrell (Stacy), of Memphis, TN, Michele, of Hazel Green, Lisa Rindy, of Elk River, MN, Glenn (Gloria), of Temecula, CA, and Chris, of Hazel Green; two sisters, Arla Mae Bussan, of Galena, IL, and Mary Ann (Joe) Leahy, of Darlington, WI; three brothers, Herbert (Margie) Havertape, of Hazel Green, Bob (Joan) Havertape, of Dubuque, and Mike (Nancy) Havertape, of Mitchell, SD; 29 grandchildren; and 36 great-grandchildren. She was also preceded in death by her parents; a brother Aloysius; a daughter Mary Ellen; and a great-granddaughter Garrett. The family would like to give special thanks to Hospice of Dubuque for their compassionate care of Katie. She was buried after 24 September 2011 at Immaculate Conception Catholic Church Cemetery, Kieler, Grant, Wisconsin. Married Name 25 October 1949 As of 25 October 1949,her married name was Kieler. Shirley Mae McCauley was born on 12 September 1928 at Iowa. She was the daughter of Leonard McCauley and Dorothy Collins. Shirley Mae McCauley married Lester L. Kieler, son of Arthur John Kieler and Elizabeth Dora Loeffelholz, on 25 October 1949. Shirley Mae McCauley died on 23 January 2005 at age 76 Shirley Mae Kieler, age 76, of Dickeyville, passed away on Sunday, Jan. 23, 2005, at her home. She was born to Leonard and Dorothy (Collins) McCauley on Sept. 12, 1928, in New Hampton, Iowa. She was a graduate of Mercy School of Nursing, Dubuque, Iowa, and she was the register nurse supervisor at Cuba City Medical Center for many years. She also worked at the Kieler and Dickeyville Clinics. Shirley married Lester Kieler on Oct. 25, 1949, at St. Raphael's Cathedral, Dubuque, Iowa. She was a member of Holy Ghost Catholic Church, Dickeyville, a member of the Christian Mothers and Legion of Mary. Shirley was committed to kindness. She will be remembered for her kindness, her timely sense of humor and her independence. Her kind manner was felt by her husband, children and grandchildren, and her patients she once cared for. Shirley had a way of instilling a sense of mutual respect for one another-in her way of showing compassion to all walks of life. She worked as a registered nurse for several years with a commitment and responsibility to others. She touched her family with love and optimism in cooking warm meals, canning, chatting and staying in touch with family events Memories of adventurous family trips to Florida, Danbury fishing, Montana, Ireland and Hawaii will be treasured. Especially worthy are the humorous events that took place on them, The time spent with you will be held close in our hearts. She also enjoyed reading, creating stain glass, and gardening. We are grateful to the helpful friends and physicians who enabled Shirley to maintain her sense of independence. Her last week, she was preparing a warm meal for her son, assisted her husband at an appointment and took him a snack that was Shirley committed to kindness. For Shirley, her quick wit, her sharp mind and strong will, she continued this at home. Until she went home forever, home to comfort, home with Les, home forever in peace. We love you Shirley. We love you Mom. Shirley loved her time spent with her children, grandchildren and great- grandchildren. She was a kind, caring and loving person who will be sadly missed and fondly remembered by all who knew and loved her. She is survived by her husband, Lester; two daughters; Lois (Dave) Fritz of Potosi, and Jenny (Greg) Loyda of Whitefish Bay; four sons, Jack (Lois) Kieler, Timothy (Shari) Kieler and Dennis (Cheryl) Kieler, all of Dickeyville, and Dean (Carie) Kieler of Lake Mills; grandchildren, Dr. Nathanial (Margaret) Kieler, Tyler Kieler, Shane Kieler, Chase Kieler, Paige Kieler, Emily Fritz, Maddie Fritz, Rachel Fritz, Timmy Fritz, Michael Loyda, Casey Loyda, Samantha Loyda, Kevin Kieler, Audrey Ann Kieler, Meghan Taylor, Travis (Kelly) Kieler, Shawn (Larry) Rogutich and Josh Kieler USN, two great-grandchildren, Dylan Kieler and Ivan Kieler; and soon to be two great-granddaughters. She was preceded in death by a son, Lester 'Les" Kieler, in 1998; her parents; a daughter-in-law, Joan Kieler; sisters, Joyce Bastian and Dorothy McCauley; and a brother, Jack McCauley Services will be at 11 a.m. on Friday, Jan. 28, 2005, at HOLY GHOST CATHOLIC CHURCH, Dickeyville, with Father Francis Steffen officiating. Burial will be in Holy Ghost Church Cemetery. Visitation will be at the church on Thursday, Jan. 27, 2005, from 4 p.m. until 8p.m., with a Parish wake service at 4 p.m. In lieu of flowers, a Shirley Kieler Memorial Fund has been established. The family of Shirley Kieler would like to thank Dr, Chapman, Dr. Schreiber and their staff for their past support, caring and kindness. Thank you also to the Dickeyville Rescue Squad and First Responders for their aid and comfort to our family and to Father Francis Steffen. She was buried after 23 January 2005 at Holy Ghost Cemetery, Dickeyville, Grant, Wisconsin. Name Variation Valentine Vincent Loeffelholz was also known as David. Name Variation Valentine Vincent Loeffelholz was also known as Harve. Name Variation Valentine Vincent Loeffelholz was also known as George V.
Valentine Vincent Loeffelholz was born on 11 May 1907 at Paris, Grant, Wisconsin. He was the son of George Loeffelholz and Matilda Kirchberg. Valentine Vincent Loeffelholz died on 22 June 1986 at age 79. Leonard McCauley married Dorothy Collins. Married Name Her married name was McCauley. Dorothy Collins married Leonard McCauley. Name Variation Lester A. Kieler was also known as Les. Lester A. Kieler was born on 4 November 1959 at Dubuque, Iowa. He was the son of Lester L. Kieler and Shirley Mae McCauley. Lester A. Kieler died on 6 May 1998 at age 38 DICKEYVILLE, Wis. - Lester A. "Les" Kieler , 38, 230 S. Center St., Dickeyville, died at 6:55 p.m. Wednesday, May 6, 1998, as the result of injuries sustained in an industrial accident in Dickeyville. Services will be at 11 a.m. Saturday at Holy Ghost Catholic Church, Dickeyville, with the Rev. Frances Steffen officiating. Burial will be in the church cemetery. Friends may call from 3 to 8 p.m. today at Haudenshield Funeral Home, Cuba City, where there will be a scripture service at 4:30 p.m.
Mr. Kieler was a stockholder and an employee at Kowalski- Kieler Inc. for 20 years. He was born on Nov. 4, 1959, at Mercy Health Center, Dubuque, son of Lester and Shirley (McCauley) Kieler . He was a graduate of Cuba City High School, class of 1978. He then attended the Madison (Wis.) Area Technical College. He was a member of the Dickeyville-Paris Fire Department for 19 years. He enjoyed his friends and family, and loved his 15 nieces and nephews, and a great-nephew. He lived for his Danbury hunting and fishing trips with his many friends, and his best friends, his mom and dad and brothers. He enjoyed making his hot salsa and grilling specialties. Les had a wonderful sense of humor and will be sadly missed by his family and friends and by all who knew him. Surviving are his mother, Shirley, and his father, Lester; four brothers, Jack (Lois) Kieler , Timothy (Shari) Kieler , and Dennis (Cheryl) Kieler , all of Dickeyville, and Dean Kieler , of Deerfield; two sisters, Lois (Dave) Fritz, of Potosi, and Jenny (Greg) Loyda, of Whitefish Bay; 15 nieces and nephews; and one great-nephew. He was preceded in death by an uncle, Jack McCauley; his grandparents; a sister-in-law; and two infant nephews. Married Name Her married name was Bastian. Joyce McCauley was the daughter of Leonard McCauley and Dorothy Collins. Joyce McCauley died before 2005. Dorothy McCauley was the daughter of Leonard McCauley and Dorothy Collins. Dorothy McCauley died before 2005. Jack McCauley was the son of Leonard McCauley and Dorothy Collins. Jack McCauley died before 2005. Married Name circa 1903 As of circa 1903,her married name was Korn. Lucy French was born circa 1882 at Illinois. She married John C. Korn circa 1903 at second marriage for him; first for her. John C. Korn was born circa 1859 at Missouri. He married Lucy French circa 1903 at second marriage for him; first for her.